This precision CNC machined wedge is constructed from ultra-rigid aircraft grade aluminum with smooth, accurate altitude and azimuth adjustments. Thirty percent more stable than competing equatorial wedges, the X-Wedge sets a new standard for equatorial stability while allowing for tracking from horizon to horizon without need of any meridian flip such as required by German Equatorial Mounts. For use with the Meade field tripods as supplied with all compatible models including 10 through 14" diameter LX200 and LX600 telescopes. Also compatible with LX90 models and discontinued models LX50, LX200 "Classic" and RCX400. Wedge can also be pier mounted (hardware not included). Equatorial mounting is required for astrophotography and imaging exposures longer than about 5 minutes. 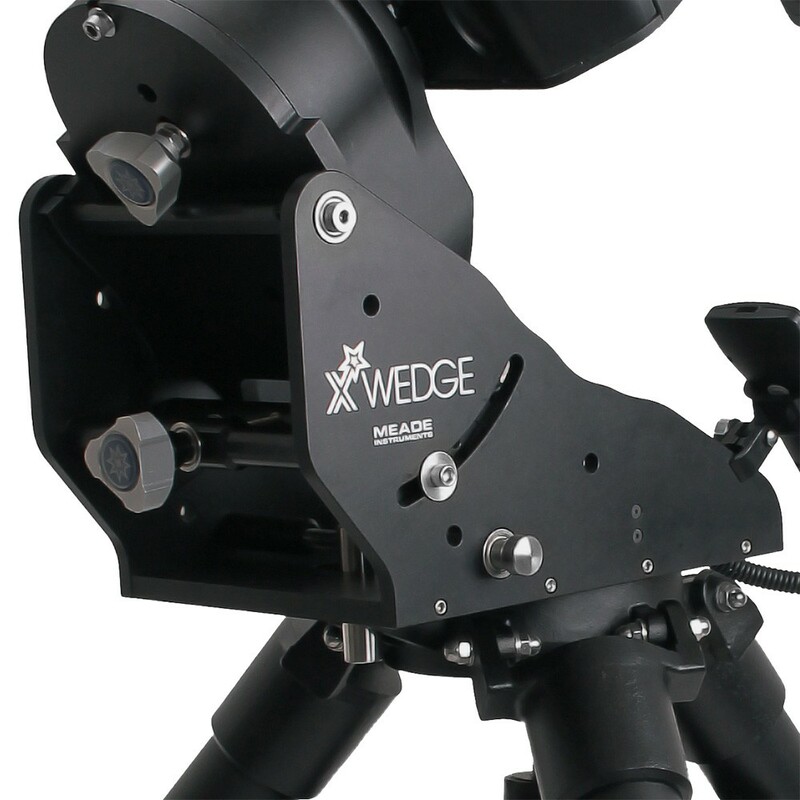 The Meade X-Wedge is mounted between a telescope and the tripod to accomplish the tilt of an equatorial type mount that matches the observer's latitude and permits precise polar alignment of your telescope. The wedge allows the astrophotographer to align the telescope's axis of rotation with the Earth's axis of rotation. This alignment eliminates stars in your long exposure photograph from appearing as a long arc, trail or streak due to an effect known as field rotation. For images under approximately 5 minutes a wedge is not necessary, the telescope may be mounted in the altitude-azimuth (alt-az) configuration normally used for visual observation.